Ahhh … if only we could tap into a nice, neat formula to ensure our decorating endeavors would be a smashing hit. The size of the dining room chandelier begs on its hands and knees for such a formula. After all, it is simple geometry, right?Well, sort of. In general, the dining room fixture should have a diameter half the diameter of the tabletop. For instance, if the table were a rectangle of 48 inches wide by 72 inches long, a 24-inch diameter would be perfect. If the table were a 60-inch round diameter, a 30-inch diameter chandelier would work. In most cases, I advise clients to err on the larger size since a “too small” fixture can ruin the look of the room. 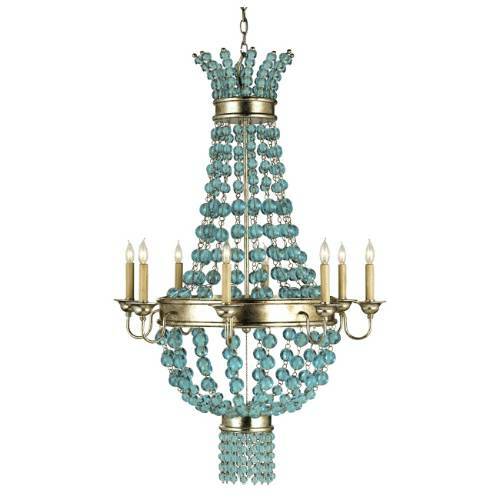 The height of the actual chandelier is usually determined by the ceiling height of the room. We follow the rule of allowing 2 1/2 inchesto 3 inches for each foot of height. Using this formula, a room with an 8-foot ceiling can use a chandelier approximately 20 inches to 24 inches in height. If the ceiling is 10 feet high, than a light fixture 25 inches to 30 inches would look more appropriate. Just when you thought your decorating life would be easier, keep in mind these are just guidelines … not hard rules! Consider the style and density of the fixture in question, and youcan push those guidelines aside. There is still the subjective element that insists on having a say! For instance, if a fixture is heavy visually with an abundance of crystal or metal, it might work better if the fixture is on the smaller side. A visually light chandelier can be a little wider in diameter. Don’t forget to be present when the perfect fixture is installed. Although the rule of thumb for distance from table to fixture is approximately 30 inches, there is nothing like a human eye to make the final decision. A few chain links can make a huge difference.